New Cafe Opening Soon at 3657 Georgia Avenue in Park View | Park View, D.C. 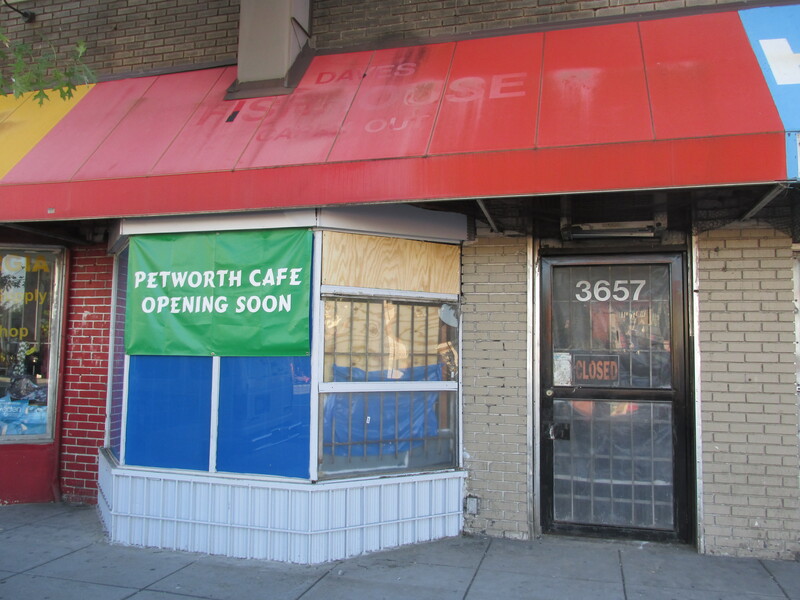 According to the sign at 3657 Georgia Avenue, the Petworth Cafe will be opening there soon. This is located on the block south of Rock Creek Church Road and next to the old hardware store, where Reliable Tavern and Hardware will be opening. I’ve heard little about this business, though what I’ve heard has been positive. Also, in checking with ABRA they have not applied for a liquor license so far. This entry was posted on August 4, 2015 at 8:01 am and is filed under Development, Restaurants, Small Businesses. You can subscribe via RSS 2.0 feed to this post's comments. Interesting, this was rumored to be a take-away place. Let’s hope that it has some seating and is family friendly and less “stand and eat out of Styrofoam containers in the doorway”. Any news on type of food? C’mon, it’s Park View people! Stop with the Petworth creep. Owners might think that Park View Patio across the street would have succeeded had it been named Petworth Patio. Or something. Blue Banana would also have done terrific had it been called Blue Petworth. Maybe there should be a new tag “South Petworth”, SoPet, to go with “North Shaw” (aka Pleasant Plains). Maybe we could rename the Park View Rec Center a block away the SoPet Rec Center. Of course I posted the same comment on that other neighborhood blog, which led to a mass deletion of the 4 comments complaining about the neighborhood name. Seriously, it is funny (or sad) how POPville constantly removes anything that disagrees with Dan’s opinion. Very regulated almost to only promote certain things. Not much free thought going on there. Agreed, I don’t go to that website anymore specifically because of his biased cherry picking. A big, green banner, hanging on a stall on 3657 Georgia Ave, NW says that a new cafe, aptly named Petworth Cafe will be opening soon. The cafe sits right next to Joe Englert s future Reliable Tav.